A clean bright original and thus scarce set of this important and detailed work covering the second half of the nineteenth century. With interesting provenance, from the library of Villiers Alwyne Caesar Hawkins, who was with the Hongkong and Shanghai Bank in Hong Kong (1882-1907), became director of the Imperial Bank of Persia (1908-193), and was also appointed a director of Hongkong Bank in 1911. 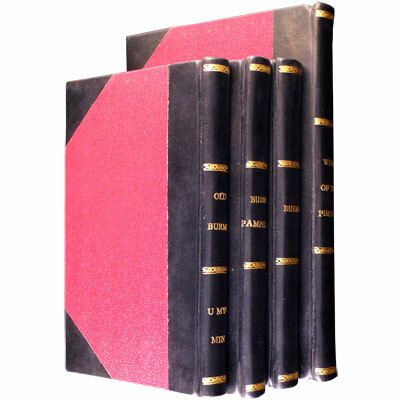 Profusely illustrated with thirty full page black and white plates, three black and white maps, a large colour folding map at the rear of volume II, and a number of vignettes throughout the text. A collective issue of three works bound into one volume, with frontispiece of Chinese Characters. History of the Pirates -A translation of the Jinghai fenji by Yuan Yonglun. Piracy on the coast of China in the nineteenth century inflicted chaos and serious economic damage, with large mobs of bandits attacking coastal villages as well as wreaking havoc at sea. Yung-lun Yüan's account of this period, published in Chinese in 1830 and in English in 1831, is a colourful depiction of the pirate scourge. Interwoven with the narratives of the pirates themselves as well as those of the courageous civilians who resisted them, the text describes the organisation and rules of the pirates as well as the authorities' attempts to broker peace. It is very much an unofficial history, the Chinese original appeared in Canton in November of the previous year. Neumann adds a querulous if learned preface, in which his aim seems to be to convince us of the ‘want of inquiry, and the childish remarks of unenlightened and uncultivated minds’ displayed by the modern Chinese regarding foreign nations. Appended is Richard Glasspoole's Narrative of My Captivity and Treatment Amongst the Ladrones. The Catechism of The Shamans or the Laws and Regulations of the Priesthood of Buddha in China - The translation of a Ming period Buddhist work Shami luyi yaolue, by Zhu Hong (Choo-hung) dealing with the discipline of novices. (Shaman here is from a Chinese word for a Buddhist priest, unconnected with shamanism). Vahram's Chronicle of the Armenian Kingdom of Cilicia during the time of the Crusades, to which is appended Letters between Pope Innocent III. and Leon the First Armenian King of Cilicia. and a Chronology of the Armenian Barons and Kings of Cilicia. 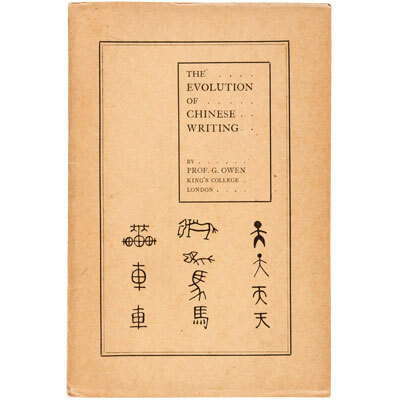 Rare and fine example of this title which contains Owen’s lecture delivered October 4th, 1910, whilst Professor of Chinese at King's College, London. George Owen (1843-1914) spent thirty-seven years as a British missionary of the London Missionary Society in Shanghai and Beijing, he was a leading figure in the translation of the New Testament into Mandarin in the Union Version, and from 1908 to 1914 was Professor of Chinese at King’s college, London. A rare first edition of this detailed and descriptive account of a journey taken by sinologist, diplomat and barrister Edward Harper Parker. His observant narrative ranges from opium, trafficking of women, infanticide, and bribery to the silk trade, farming, local customs and beliefs. Illustrated with eight sketch maps (six of which are folding). 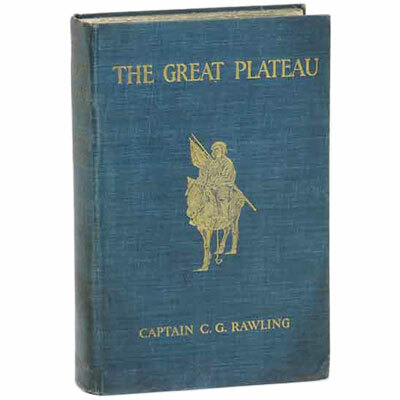 First Edition of Rawling’s important account of his unofficial and official surveys through Tibet, illustrated with 57 photographs (on 32 plates) and two folding maps. ‘In 1903 Rawling explored the Zoji La, Leh, Chang Chemmo, Lanak La with Hargreaves and Ram Singh. Then he explored and surveyed, with C. H. D. Ryder, from Lhasa to Simla by the valley of the Brahmaputra and Lake Manasaro-war, as a detachment of the Younghusband Tibet Mission in 1904’. In addition to taking part in a survey that established Everest as the highest mountain in the world, Rawling would have also been the first man to attempt a climb of the North Face of Everest if his senior officers had allowed!